The largest language group people today are the Anangu Pitjantjatjara who live in the area around Uluru (Ayers Rock) and south into the Anangu Pitjantjatjara Yankunytjatjara Lands in South Australia. The second largest Aboriginal community are the Arrernte people who live in and around Mparntwe (Alice Springs). The third largest are the Anangu Luritja, who live in the lands between the two largest just mentioned. The Aboriginal languages and dialects with the largest number of speakers today are the Pitjantjatjara, Warlpiri and Arrernte. The Ngunnawal people were the first inhabitants of the area which is now occupied by the city of Canberra and the Australian Capital Territory. They spoke the Ngunnawal language. The city of Canberra is named after the Ngunnawal word Kambera. Many other place names around Canberra are Ngunnawal names, such as Tuggeranong, Ginninderra, Murrumbidgee, the suburb Ngunnawal and many road names. Alyawarre who live north-east of Alice Springs. In 1980 they lodged a land claim, which was handed back to them on 22 October 1992. The size of the land was 2,065 km2 (797 sq mi). Anmatjera from an area near Mount Leichhardt, Hann and Reynolds Ranges, and northeast to Central Mount Stuart. Artist Clifford Possum is an Anmatjera man. Emily Kngwarreye was also an Anmatjera woman. The Arrernte people speak the Upper Arrernte language, and live in the Arrernte area of Central Australia. The population of Arrernte people living on Arrernte land (including Alice Springs) is estimated at 25,000, making it the second largest of all Central Australian Aboriginal countries, after Pitjantjatjara. In most primary schools in Alice Springs, students (of all races and nationalities) are taught Arrernte (or in some cases Western Arrernte) as a compulsory language, often alongside French or Indonesian languages. Additionally, most Alice Springs High Schools give the option to study Arrernte language throughout High School as a separate subject, and it can also be learned at Centralian College as part of a TAFE course. Future plans are that it will be included as a university subject. Approximately 25% of Alice Springs residents speak Arrernte as their first language. Gurindji, who from 1966 to 1975 at Wave Hill Cattle Station had a strike known as The Gurindji Strike. In 1975, the Australian Labor Party government of Gough Whitlam finally negotiated with the Vesteys to give the Gurindji back a portion of their land. This was a landmark in the land rights movement in Australia for Australian Aboriginal people to be given rights to their traditional lands. The Kunibidji, or Gunivugi, people live by the Liverpool River in Arnhem Land. They are Aboriginal people and speak the Ndjébbana language. They hunt dugong, turtle and fish. Luritja is a name used to refer to several dialects of the Western Desert Language, and thereby also to the people who speak these varieties, and their traditional lands. The Luritja lands include areas to the west and south of Alice Springs, extending around the edge of Arrernte country, which lie roughly between Alice Springs and Uluru. The total population of Luritja people (including Papunya Luritja) is probably in the thousands making them the third largest of the Central Australian Aboriginal populations. It includes the town of Papunya. The Murrinh-Patha are a small group, living inland from the settlement of Wadeye, between the rivers Moyle and Fitzmaurice. Their language, also called Murrinh-Patha, is still spoken by about 900. The Murrinh-Patha culture is characterized by typical Native Australian social structure, including a complex kinship system with elaborate behavioral norms for interactions between the different kinship groups. The Pitjantjatjara, or Anangu, people are an Aboriginal people of the Central Australian desert who speak the Pitjantjatjara language. Their influence extends from the area near Uluru in the Northern Territory to the Nullarbor Plain in South Australia. Their language is one of the most widely spoken Aboriginal languages. Nearly 2,500 Tiwi people live in the Bathurst and Melville Islands, which make up the Tiwi Islands. Warlpiri is a large group in the Northern Territory. There are 5000–6000 Warlpiri, living mostly in a few towns and settlements scattered through their traditional land, north and west of Alice Springs. Their largest community is at Yuendumu. Many Warlpiri, unlike people from other Aboriginal language and community groups, do not speak even a word of English. Warlpiri are famous for their tribal dances. Many Warlpiri have toured England, Japan, and most recently Russia, performing their dances. The Yolngu inhabit north-eastern Arnhem Land in Australia. Some Yolngu communities of Arnhem land re-figured their economies from being largely land-based to largely sea-based with the introduction of Macassan technologies such as dug-out canoes, after the Macassan contact with Australia. These seaworthy boats, unlike their traditional bark canoes, allowed Yolngu to fish the ocean for dugongs and turtles. Some Aboriginal workers willingly accompanied the Macassans back to their homeland across the Arafura Sea. The Yolngu people also remember with grief the abductions and trading of Yolngu women, and the introduction of smallpox, which was epidemic in the islands east of Java at the time. The Guugu Yimithirr are another language group. There are still several hundred speakers of the Guugu Yimithirr language, mostly living in and around Hopevale, Cooktown, and Wujal Wujal on Cape York Peninsula in northern Queensland. The site of modern Cooktown was the meeting place of two vastly different cultures when, in June 1770, the local Aboriginal Guugu Yimithirr people cautiously watched James Cook's crippled sailing vessel — HM Bark Endeavour — limp up the coast of their territory seeking a safe harbour. The word kangaroo comes from the Guugu-Yimidhirr name for a Grey Kangaroo, gangaroo. The Kalkadoon people live in the area around Mount Isa in Western Queensland. There was fighting between the Kalkadoon and police in the nineteenth century; in 1884, 200 of them were massacred at "Battle Mountain" in a fight against police. There are a number of Torres Strait Islander groups inhabiting the Torres Strait Islands between mainland Australia and Papua New Guinea. The Adnyamathanha, or Adynyamathanha, (pronounced /ˈɑːdnjəˌmʌdənə/) are an Indigenous Australian people from the Flinders Ranges. Adnyamathanha is also the name of their traditional language. The Adnyamathanha are made up of the Kuyani, Wailpi, Yadliaura, Pilatapa and Pangkala, which are the traditional groups of the Northern Flinders Ranges and (with the Kokatha) the areas around Lake Torrens. The name Adnyamathanha means "rock people" and is a term referring to the Lakes Culture societies living in that area. They share a common identity, which they get from their ancestors, this common bond is their language and culture which is known as Yura Muda. The Dieri is an Australian Aboriginal group and (now extinct) language from the South Australian desert—specifically Cooper and Leigh Creek, Lake Howitt, and Lake Hope, Lake Gregory and Clayton River and low country north of Mount Freeling. The Dieri protested the Marree Man geoglyph, saying that it had caused them harm and was exploiting their Dreamtime stories. The Kaurna people have traditional lands in and around the Adelaide Plains. The people lived in independent family structures in defined territories called pangkarra. The Kuarna performed circumcision as an initiatory right and were the southernmost community to do so. The last surviving speaker of Kaurna as a mother-tongue died in 1931. The Maralinga Tjarutja inhabit the remote western areas of South Australia. They are a Southern Pitjantjatjara people. The Maralinga Tjarutja native title land was handed back to the Maralinga people in January 1985 under legislation passed by both houses of the South Australian Parliament in December 1984 and proclaimed in January 1985. Maralinga people resettled on the land in 1995 and named the place Oak Valley Community. 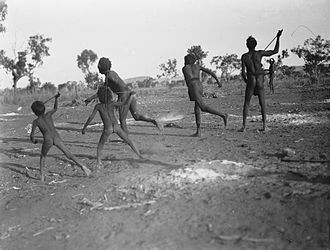 The local Aboriginal people were not warned effectively of the explosions from 1950s nuclear testing and many suffered terrible after-effects from fallout, although the 1984/1985 Royal Commission could find no evidence of this for the Maralinga Tjarutja. Ngarrindjeri is the language and traditional Aboriginal people of the lower Murray River and western Fleurieu Peninsula. The traditional areas extend from Mannum downstream through Murray Bridge and Goolwa and along the coast through Victor Harbor to Cape Jervis to the southwest and around Lake Alexandrina and Lake Albert and the Coorong to around Kingston SE. The Ngarrindjeri achieved a great deal of publicity in the 1990s due to their opposition to the construction of a bridge from Goolwa to Hindmarsh Island, including a Royal Commission and a High Court case in 1996. There was an Aboriginal legend about a sea creature called the Muldjewangk which inhabited the Murray River, particularly Lake Alexandrina. 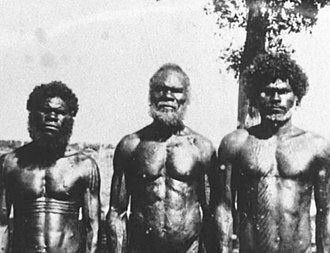 Narungga were people of the Yorke Peninsula, many of which were removed by missions as part of the stolen generation. Twentieth-century historians previously held that Aboriginal Tasmanians had become extinct with the death of Truganini in 1873, but this is no longer the accepted view. 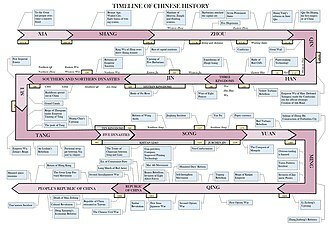 The original population, estimated at from 3000 to 15,000 people (The rate of genetic drift indicates that the maximum estimate is likely the lower boundary while archaeological evidence suggests numbers of up to 50,000) was reduced to a population of around 300 between 1802 and 1833 mainly due to the actions of white settlers who came to Australia from the United Kingdom, combined with disease and cultural disruption. The Black War (1828–1832) and subsequent Black Line in 1830 were turning points in the relationship with European settlers. Even though many of the Aboriginal people managed to avoid capture during these events, they were shaken by the size of the campaigns against them. In 1828, Tarerenorerer (or Tarenorerer), a Punnilerpanner woman who had escaped from sealers, became the leader of the Emu Bay people (Plairhekehillerplue). Attacking settlers with stolen weapons, this is the first recorded use of muskets by Aboriginal people. Mannalargenna, the leader of the Ben Lomond people (Plangermaireener) organised guerrilla attacks against British soldiers in Tasmania and in 1835 became the first Aboriginal person in Tasmania to be given a "Christian" burial. The Gunai, or Kurnai, nation live in the area of south eastern Victoria, around Wilsons Promontory, Sale, Bairnsdale, Lakes Entrance, Snowy River and Mallacoota. 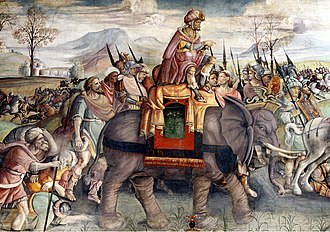 The Gunai people resisted the European invasion of their land. 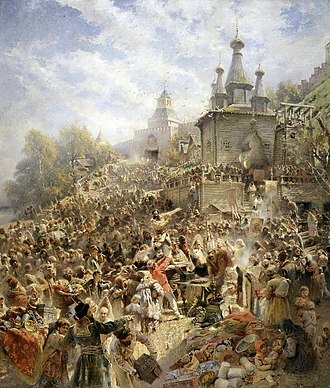 Many were killed in fighting between 1840 and 1850. In 1863 Reverend Friedrich Hagenauer established Ramahyuck Mission on the banks of the Avon River near Lake Wellington to house the Gunai survivors from west and central Victoria. The Kulin alliance is one of the Indigenous nations of Australia who lived in central Victoria, around Port Phillip where Melbourne now stands, and Western Port, up into the Great Dividing Range and the Loddon and Goulburn River valleys. It included the Wurundjeri and Bunurong clans. 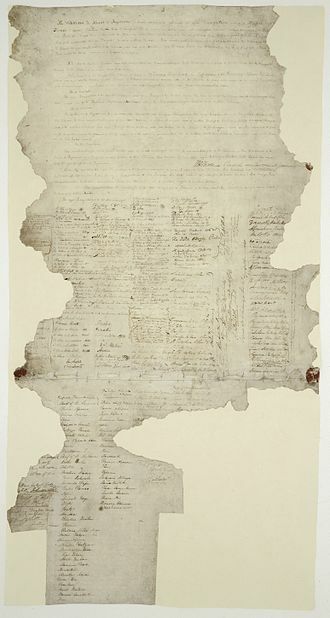 On 6 June 1835 John Batman signed a 'treaty' (known as Batman's Treaty) with the Wurundjeri people where he purported to buy 2,000 km2 (770 sq mi) of land around Melbourne and another 400 km2 (150 sq mi) around Geelong, on Corio Bay to the south-west. In exchange he gave the eight elders, whose marks he acquired on his treaty, a quantity of "blankets, knives, tomahawks, scissors, looking-glasses, flour, handkerchiefs and shirts." By 1863 the surviving members of the Wurundjeri and other Woiwurrung speakers were given "permissive occupancy" of Coranderrk Station, near Healesville. William Barak was the last ngurungaeta of the Wurundjeri-willam clan. Bunjil is seen as the culture-hero or god of the Kulin people. The Bunurong were referred to by Europeans as the Western Port or Port Philip group. The Yorta Yorta people traditionally lived around the junction of the Goulburn and Murray Rivers in present-day north-eastern Victoria. Family groups include the Bangerang, Kailtheban, Wollithiga, Moira, Ulupna, Kwat Kwat, Yalaba Yalaba and Ngurai-illiam-wurrung clans. Their language is generally referred to as the Yorta Yorta language. Prominent Yorta Yorta people include Burnum Burnum and Sir Douglas Nicholls. The Jarrakan are one of several groups in the north of the state. The Noongar (alternate spellings: Nyungar, Nyoongar) are a group of Australian Aboriginal people who live in the south west of Western Australia from Geraldton in the mid west to Esperance on the south coast. The population of the Noongar at the time of European arrival was estimated between 6000 and 10,000. The population in the 2001 census was 21,000. [clarification needed] The Beeliar group encountered English settlers when they arrived in and established the Swan River Colony in 1829. Captain James Stirling declared that the local peoples were British subjects. Although the Nyungar at first traded amicably with the settlers, as time wore on, rifts and misunderstandings developed, and attacks and reprisal attacks grew. This resulted in the death of Yagan, who is now seen by many as one of the first Indigenous resistance fighters. The name of Mokare is commemorated for mediating peace between the colonists at King George Sound and his own people, and assisting in the exploration of the region. Many place names in Western Australia are named after Noongar words, especially those ending in "up" or "in/ing" (both meaning "place of" in different dialects) such as Joondalup, Manjimup, Narrogin and Merredin. The Spinifex people, or Pila Nguru, have their traditional lands situated in the Great Victoria Desert, in the Australian state of Western Australia, adjoining the border with South Australia, to the north of the Nullarbor Plain. They maintain in large part their traditional hunter-gatherer existence within the territory, over which their claims to Native title and associated collective rights were recognised by a 28 November 2000 Federal Court decision. The Australian Royal Commission was unable to determine if Pila Nguru people had been exposed to damaging levels of radiation from fallout after the nuclear testing near Maralinga in the 1950s. ^ Laurent Dousset. 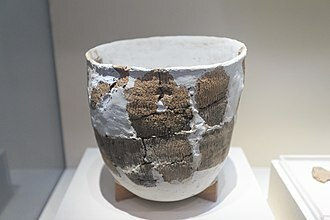 "Detailed record of the Narangga". ausanthrop.net. ^ Green, Neville (2005). "Mokare (c. 1800 - 1831)". Australian Dictionary of Biography. Canberra: Australian National University. Retrieved 2008-08-03. Journeys in Time - Australian Aboriginal Tribes A joint project between Macquarie University and the State Library of New South Wales providing researchers and students with documentation from original English settlers. retrieved 16 January 2007. "The Kinship online learning module aims to provide a deeper understanding of the richly complex aboriginal Kinship system by learning about the components of Moiety, Totem, Skin Names, language and traditional affiliations and individual identity." © 2002-16 The University of Sydney. Murrumbidgee River, a major tributary of the Murray River within the Murray–Darling basin and the second longest river in Australia. It flows through the Australian state of New South Wales and the Australian Capital Territory, the word Murrumbidgee means big water in the Wiradjuri language, one of the local Aboriginal languages. The river itself flows through several traditional Indigenous Australian lands, home to various Aboriginal tribes, in the Australian Capital Territory, the river is bordered by a narrow strip of land on each side, which are both managed as the ‘Murrumbidgee River Corridor’. This land includes nature reserves, eight recreation reserves, a European heritage conservation zone, the mainstream of the river system flows for 900 kilometres. From its headwaters it flows to its confluence with the Murray River, the river flows for 66 kilometres through the Australian Capital Territory near Canberra, picking up the important tributaries of the Gudgenby, Queanbeyan and Cotter Rivers. The Murrumbidgee drains much of southern New South Wales and all of the Australian Capital Territory, tantangara Dam was completed in 1960 on the headwaters of Murrumbidgee River and diverts approximately 99% of the rivers flow at that point into Lake Eucumbene. This has extremely serious effects on fish populations and other native aquatic life and has led to serious siltation, stream contraction, fish habitat loss. The Murrumbidgee where it enters the ACT is effectively half the river it used to be, a study suggests a section of the upper rivers channels are relatively new in geological terms, dating from the early Miocene. It is suggested that the Upper Murrumbidgee is an anabranch of the Tumut River when geological uplift near Adaminaby diverted its flow, from Gundagai onwards the rivers flow within its ancestral channel. The Murrumbidgee River runs through the lands of the Ngunnawal, Nari Nari. The Murrumbidgee River was known to Europeans before it was discovered by them. In 1820 the explorer Charles Throsby informed the Governor of New South Wales that he anticipated finding a river of salt water. The District of Tuggeranong is one of the original eighteen districts of the Australian Capital Territory used in land administration. The district is subdivided into divisions and blocks and is the southernmost town centre of Canberra, the district comprises nineteen suburbs and occupies 117 square kilometres to the east of the Murrumbidgee River. The name Tuggeranong is derived from a Ngunnawal expression meaning cold place, from the earliest colonial times, the plain extending south into the centre of the present-day territory was referred to as Tuggeranong. At the 2011 census, the population of the district was 86,900, the traditional custodians of the district are the indigenous people of the Ngunawal tribe. 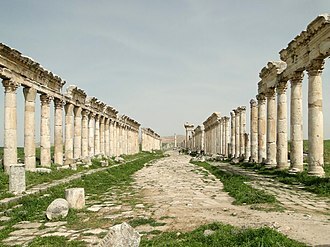 5 which, after the enactment of the Australian Capital Territory Act 1988 and this Act was subsequently repealed by the ACT Government and the district is now administered subject to the Districts Act 2002. Cave paintings and Aboriginal artifacts discovered in the area confirm that the Tuggeranong region has been occupied by the original inhabitants, in 1823 Joseph Wild was employed by Brigade Major John Ovens and Captain Mark Currie to guide them to the Murrumbidgee. They travelled south along the river and named the now known as Tuggeranong Isabellas Plain in honour of Governor Brisbanes infant daughter. Unable to cross the river near the current site of Tharwa, the last expedition in the region was undertaken by Allan Cunningham in 1824. Cunninghams reports verified that the region was suitable for grazing, in 1828, the bushranger John Tennant, known as the Terror of Argyle, was captured by James Ainslie and a party of others near the Murrumbidgee River in Tuggeranong. Tennant had been a convict assigned to Joshua John Moore at Canberry, mount Tennent, behind Tharwa, is named after the bushranger. The first authorised settler was James Murdoch, in 1824 he was offered a land grant on a small plain known by the natives as Togranong meaning cold plains. He took up the grant in 1827, Lanyon station was established in 1835 and originally owned by James Wright, his brother William and John Lanyon. Wright bought the property from Lanyon, who had remained in Australia for three years. It lies 335 km south west of the nearest large town, Alice Springs,450 km by road. Uluru is sacred to the Pitjantjatjara Anangu, the Aboriginal people of the area, the area around the formation is home to an abundance of springs, rock caves and ancient paintings. Uluru is listed as a UNESCO World Heritage Site and Kata Tjuta, known as the Olgas, are the two major features of the Uluṟu-Kata Tjuṯa National Park. The local Anangu, the Pitjantjatjara people, call the landmark Uluṟu and this word is a proper noun, with no further particular meaning in the Pitjantjatjara dialect, although it is used as a local family name by the senior Traditional Owners of Uluru. On 19 July 1873, the surveyor William Gosse sighted the landmark and named it Ayers Rock in honour of the Chief Secretary of South Australia, since then, both names have been used. In 1993, a dual naming policy was adopted that allowed official names that consist of both the traditional Aboriginal name and the English name, on 15 December 1993, it was renamed Ayers Rock / Uluru and became the first official dual-named feature in the Northern Territory. The order of the names was officially reversed to Uluru / Ayers Rock on 6 November 2002 following a request from the Regional Tourism Association in Alice Springs. Uluru is one of Australias most recognisable natural landmarks, the sandstone formation stands 348 m high, rising 863 m above sea level with most of its bulk lying underground, and has a total circumference of 9.4 km. Uluru is notable for appearing to change colour at different times of the day and year, most notably when it glows red at dawn, Kata Tjuta, called Mount Olga or the Olgas, lies 25 km west of Uluru. Special viewing areas with access and parking have been constructed to give tourists the best views of both sites at dawn and dusk. Uluru is an inselberg, literally island mountain, an inselberg is a prominent isolated residual knob or hill that rises abruptly from and is surrounded by extensive and relatively flat erosion lowlands in a hot, dry region. Uluru is referred to as a monolith, although this is a somewhat ambiguous term that is generally avoided by geologists. Bathurst Island is one of the Tiwi Islands in the Northern Territory off the northern coast of Australia along with Melville Island. The largest settlement on Bathurst is Wurrumiyanga, in the south-east, located on the south east corner of Bathurst Island, Wurrumiyanga is approximately 70 km north of Darwin. The second largest settlement is Wurakuwu, pop,50,60 km northwest of Wurrumiyanga. The third settlement on the island is a small family outstation called 4 Mile Camp, the island was named after Henry Bathurst, 3rd Earl Bathurst, like Viscount Melville, is commemorated by a Canadian island. During the Bombing of Darwin the first wave of 188 Japanese planes was spotted by Father John McGrath, Father McGrath sent a message on the radio saying An unusually large air formation bearing down on us from the northwest. Nearly everyone ignored this, though it was on the most popular radio station, about an hour there were roughly 100 people dead, but the people who followed his instruction all survived. Panorama of Uluru around sunset, showing its distinctive red colouration at dusk. 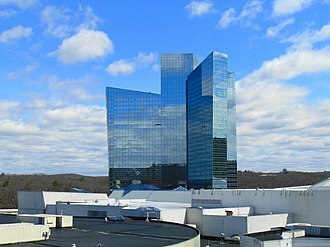 The Mohegan Sun casino commemorates the site of the world's first common-law indigenous land rights case, decided in 1773. Rainbow over the Nullarbor Plain. A type of Macassan perahu, the padewakang. Traditional burial poles, Tiwi Islands, 2005. Tiwi Island decorated carvings, 2005. "Vincent, May 1968" (Vincent Lingiari); charcoal on paper, by Frank Hardy, drawn while researching his book, The Unlucky Australians.